Twenty-eight year old Abigail Wendover arrives home in Bath after having helped one of her sisters. The poor dear; all was an uproar at her home; all three children had the measles, the nurse fell down the back-stairs and broke her leg, and she’s due to have her fourth child at any moment! After order is restored by Abby’s level-headed nursing and reassurances she treats herself to a visit to London. She shops and enjoys herself until her lecturing brother descends upon her with the news that her niece, Fanny is being courted by a ‘gamester and gazetted fortune hunter,’ Mr. Stacy Caverleigh. Stacy Caverleigh has done his best to charm her and his decided air of fashion puts him in her good graces. Fanny who will make her debut in London within a few months is a precocious young lady who knows her own mind but still has romantical school-girl notions, which makes her ripe for all kinds of outrageous folly. Abby hopes for an opportunity to speak with Mr. Caverleigh without Fanny’s knowledge and the perfect opportunity happens when while writing a note to acquaintances that are arriving in Bath at fashionable York House she hears “Carry Mr. Caverleigh’s portmanteaux up to No. 12.” She is surprised when she looks up and sees a gentleman older than she and in clothing too loose-fitting to be considered even remotley fashionable. She introduces herself to him in a humorous scene of cross-purposes and mistaken identities. The Mr. Caverleigh to whom she is speaking is no other than the black sheep of that family, Miles, who was not only expelled from Eton but had done such extravagant follies he was packed off to India. Will Fanny elope with Stacy Caverleigh? And will Abby ever be able to stop laughing at something Miles Caverleigh says when she is really most vexed with him? This is my third Georgette Heyer read, her novels have such incredible plots and humor I love her style of writing dialogue; It’s playful and witty and her characters come alive with it. Miles Caverleigh is like a mixture of Henry Tilney and Mr. Bennet but in latter’s case he’s met his intellectual equal. Katherine blogs at November’s Autumn. She lives in the Seattle area and has a great love for English literature, the arts, and period dramas. She was introduces to Jane Austen six years ago after watching the 1980s adaptation of Pride and Prejudice and has been a Janeite since she read Sense and Sensibility shortly thereafter. Her friend Laurel Ann recently introduced her to Georgette Heyer who she’s found entertaining and delightful! You can follow Katherine on twitter as NovembersAutumn. 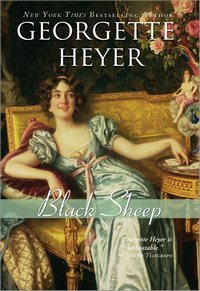 Enter a chance to win one copy of Black Sheep, by Georgette Heyer (Sourcebooks, 2008) by leaving a comment stating what intrigues you about the plot or characters, or if you have read it, which is your favorite character or scene by midnight Pacific time, Monday, September 6th, 2010. Winners will be announced on Tuesday, September 7th, 2010. Shipment to continental US and Canadian addresses only. Good luck! I read this one earlier in the summer, and I just LOVED it! I really loved how the relationship developed between Abby and Miles. The dialogue between the two was just great! All these reviews have almost convinced me to give Georgette Heyer a try! I love mistaken identities! I want to read this one. Black Sheep was my introduction to Georgette Heyer so it is guaranteed that it serves as an excellent recommendation for beginners. For me the title was an attraction itself, who could be the ‘black sheep’, then the setting Bath -a place so known for Janeites- and a ‘mature’ heroine. The chemistry between the main characters it is evident from the very first encounter between them, in their witty exchanges. To make it more intriguing, there is an elopement, or to be more precise, an abdjuction. You will have read it to know who take part in this, he, he, he. All these reviews are throwing off any other reading plans I might have had, sending me to my shelves to reread old favourites! I know a friend is reading Black Sheep right now for the first time so, as a good friend, I must clearly reread it myself so that we can have brilliant discussion about how wonderful Heyer is and much we enjoy Miles and Abby. Another Heyer title I just love to read again and again. I think my favourite scene in this book is the meeting in the hotel between Abigail and Mr. Clavering – not quite what she was expecting! I just re-read this last night, knowing it was coming up. Miles is a very atypical Heyer “hero”, but we, just as Abby, respond to his direct honesty and sense of humor. This is one of my favorite Heyer novels and the one that made me fall in love with her writing. I adore the wittty repartee between Abby and Miles. Miles is my favorite character because he’s so unusual and has a lot of depth. I fell in love with his sense of humor and his odd way of doing nice things. The end of the book infuriates me though because I want to know what happened next! I appreciate the way this review was written, because the first time you read it it’s most fun if it’s fresh. But now that I’ve read it close to a dozen or so times, I can enjoy all my favorite stuff even earlier! Mostly Miles & his sense of humor. Bath, witty dialogue, and mistaken identity… sounds like a sure hit for me! =) Thanks for an engaging review, Katherine! What in the world did the black sheep do? I have not read this one, but it sounds wonderful, and typical of Heyer – great characters, witty dialog, the Bath setting combine to intrigue. The scene mentioned in the review of mistaking one person for another – enough to add this one to the wish list. The set-up of this story makes me think a little of Persuasion, with the unmarried sister bringing help and sense to her married sister’s household. But it sounds like the stories diverge widely after that point! Oops, I meant MILES Caverleigh, not Stacy! I loved Mile’s sense of humour. He made me laugh with his unothordox behavior and devil may care attitude. A black sheep, indeed. Without giving away too much this book had a very unusual and dramatic ending compared to other Heyer novels. I’ve always heard great things about Black Sheep and it is definitely yet another Heyer novel that is high on my list. Miles and Abby sound like a delight to read about! I love the titles Heyer used. So descriptive of what occurs in the novel. This sounds fun! I can’t wait to read it. Thanks for the review. I love how Abby and Fanny both fall for the Caverleigh brothers, each with their own flaws. I must admit I’m sort of reluctant to try this one, because it’s often compared with “Lady of Quality”, which I actively disliked. But I’ve also heard that it’s much better that LoQ, so I know I’ll give it a try at some point. Your description of Miles being a mixture of Henry Tilney and Mr. Bennett has definitely made me feel better about it, too. I’m intrigued to see if Heyer can take the same basic situation and make it as appealing to me in one novel as it was annoying in the other…. I haven’t read Lady of Quality but I have read Cotillion and Reluctant Widow, both of which I enjoyed. I rank Black Sheep as my favorite so far I hope you’ll give it a try! Thanks for your response! I certainly will – but I’m going to let my memories of LofQ die away a little bit before I do so, probably read several others in between. I think that is by far the wisest course to take in this situation. I’m intrigued by the starting off with mistaken identities. It has been many years since I read this-need to do so again.